A spectacular geological feature are the Les Penitents des Mees in the Provence, France. The legend behind Les Penitents des Mees is that the rocks present the Monks of the Lure Mountain who were turned into rock by Saint Donat, a hermit. The punishment was due to the monks falling in love with the beautiful "Mauresques" women who'd been captured by a lord after a crusade in the 6th century. The rocks look like a procession of hooded monks. The village of Les Mees, with a population of approximately 3000, is nestled in at the foot of the narrow columns of rock at the north end of the procession. Les Penitents des Mees, rows of columnar rocks over 100 metres high and over 2 kms long near the village of Les Mees, Alpes de Haute, Provence, France, Europe. 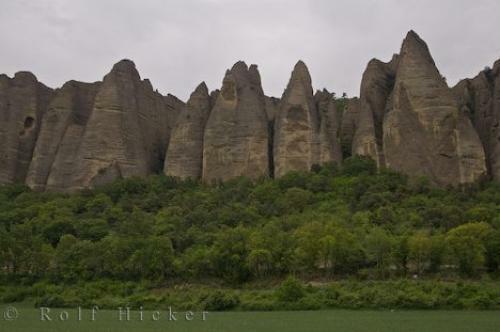 Photo of the intriquing formations of Les Penitents des Mees, in the Alpes de Haute, Provence, France.